The culture education-to-action gap is also vast because culture can seem to be endlessly complicated. This is unfortunate, because leaders often feel compelled to take action to accelerate results through culturally intelligent means when they receive accurate guidance about how to make their invisible organization visible and to evolve it with intent. Culture is the fuel to maximize performance, but it’s been hijacked to mean everything from being a “fun” or “happy” workplace to a great place to work. 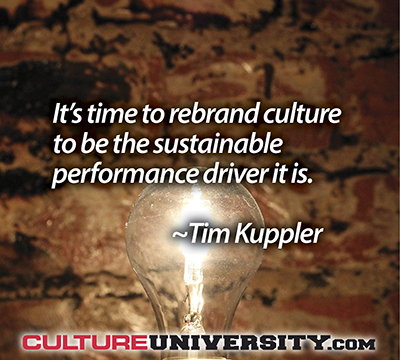 It’s time to rebrand culture to be the sustainable performance driver it is. Most organizations lack a language for culture. We each deal with a cultural battlefield in our mind, and it’s even more complicated when we are in groups. We may struggle with whether we should raise an idea, disagree with a coworker, check with our boss before proceeding, and far more as we interact with others. We also deal with deeply ingrained beliefs and assumptions because we’re so used to trying to fit in and be accepted. The language of the current culture in organizations is more likely to be present around the water cooler than in strategy meetings or boardrooms where leaders are making critical decisions that will depend on meaningful change. Most organizations lack a measurement for culture. Culture is viewed by many as ambiguous and difficult to grasp, let alone measure. Others think they measure attributes of the culture with their engagement, great place to work, or so-called “culture” surveys that only measure the work climate (engagement, involvement, teamwork, satisfaction, etc.). Measuring the entire culture is impossible, but it is possible to measure basic norms, expectations, or “unwritten rules” that drive behavior. It’s also important to integrate qualitative (interviews, focus groups, etc.) and quantitative methods to provide meaningful understanding (stories, examples, etc.). Unfortunately, most organizations aren’t used to integrating these two areas with clarity. Most leaders lack an understanding of culture change. The lack of a language and valid measurement system handicaps leaders before they even have a chance to learn about culture change— but that might actually be an advantage for most leaders when it comes to culture change. Just check out the Ted Talk from Isaac Lidski if you disagree, where Issac “challenges us to let go of excuses, assumptions, and fears, and accept the awesome responsibility of being creators of our own.” Culture pioneer Edgar Schein believes cultural rules drive 90% of our behavior in organizations. Leaders still chase culture fantasy and want to grasp it without investing the time to truly learn basic but powerful fundamentals about connecting culture change and performance improvement. Culture and performance improvement efforts are hard and messy. There is no easy way out. There are no quick fixes. Leaders must turn away from the more superficial solutions and invest the time to understand their culture, the impact their leadership is having on it, and what they can do to improve performance through culturally intelligent approaches. Most organizations are missing a clear connection between culture, team building, and leadership development. Well-intended change efforts will bog down unless teams, leaders, and other individuals are developed in clearly connected ways. A myriad of talent models exist that lack any clear and defined connection to culture. Organizations waste billions of dollars training people to go back in the workplace and be crushed by the current culture, as they feel compelled to fall in line with existing norms despite what they may have learned. Team members fall in line due to social norms, fear, personal struggles, peer pressure, and a lack of knowledge or framework to deal with the cultural headwinds. What’s crazy is that most organizations are not on a common journey to define those cultural headwinds and arm team members with the knowledge to deal with them effectively. Many think more layers of systems, training, or a different kind of leadership will be enough to overcome them. Most organizations fail to connect culture and strategy. Most strategies are pre-determined by culture in ways leaders don’t even realize. When leaders do connect the two subjects—culture and strategy—the four reasons referenced above make it nearly impossible to truly shift the culture in ways that accelerate the strategy and related results. How can you develop an effective strategy if you don’t fully understand the cards you have been dealt? Brilliant strategies are submarined by culture issues every day, and the sad part is leaders typically don’t even realize it’s culture, so they may doubt themselves or, worse, blame others. Let’s review. The visual below is a quick summary of just a few critical elements of the culture-education gap we see presently in organizations. Is it any surprise that most organizations need a culture reboot? Edgar Schein also said you don’t really begin to understand your culture until you try to change it. The gaps above can start to close in very meaningful ways in less than six months. The good news is that initial results or positive outcomes for the organization, teams, and individuals must also be visible in some form in about the same time. This is not to say that culture change must happen in six months, but there must be some meaningful and, ideally, measurable results in key indicators during a “short” time. Why would leaders and team members stick with a change effort if they don’t begin to see results with some leading indicators in around six to nine months? I have asked numerous culture experts and leaders for their feedback on this specific timeframe, and most responses are around six to nine months (and some are even shorter). The issue with culture these days is not surfacing new insights or knowledge; it’s accessing knowledge that already exists and applying it correctly. It’s like the medical field as described in the book The Checklist Manifesto. The medical field is extremely complex, like culture, and “we have accumulated stupendous knowledge…nonetheless, avoidable failures are common and persistent, not to mention demoralizing and frustrating.” A failure in the organizational culture field can have disastrous results for the organization and team members burdened by confusion, hesitation, stress, and even fear. But what if we started to think about culture differently? What if the insights from the pioneers of the culture field were widely known instead of the latest “blah blah” culture blog post or New York Times article about another culture crisis? Let’s flip the table and change our perspective. You may already know some of the key points, but maybe, just maybe, there’s an “aha” regarding something you didn’t realize or haven’t thought about when it comes to supporting the purpose and performance of your organization. Let’s tackle these five common culture gaps and start, or continue, your journey to master the big picture of culture change and performance improvement. We all talk about culture differently. Unfortunately, everything has become “culture” these days and nearly all assessments and surveys for engagement, culture, and satisfaction measure the surface of culture at best. These popular assessments focus on aspects ranging from understanding the mission or purpose to perceptions and attitudes about teamwork, change, innovation, strategy, involvement, empowerment, and countless other areas. Many tout research that identifies when employees provide positive feedback about these and other areas, those organizations have higher profitability, employee satisfaction, retention, and many other outcomes (not exactly a shocking conclusion). Experts and assessment firms share best practices and insights from other great places to work and encourage you to apply them in your organization. As tantalizing as these solutions are, they are only part of the framework to begin to understand culture, because most of this information is about the work climate. An issue with the work climate (engagement, involvement, teamwork, motivation, etc.) can be due to countless underlying reasons from a culture perspective. Think about it. Is that teamwork issue due to power-oriented, command-and-control issues, internal competition, fears about making a mistake, issues with avoidance where team members never want to be blamed for problems, or something else? Yes, feedback about the work climate can help, but it does not give you the language to talk about behavior, what team members believe to be true and, most importantly, why. The answers to these questions and at least part of the language of culture can come through a well-organized assessment that helps clarify the elusive concepts of culture and climate. Is it possible to measure culture? If so, how? Edgar Schein shared some related insights: “Culture analysis and change are very much ‘in’ these days. It is vital that organizations understand deeply what culture is, what it does, and how to analyze it as part of a change program. To do this effectively requires both a qualitative and a quantitative approach to managing the culture change process.” Many aspects of a common language, measurement, and deeper understanding of culture can come through a combination of qualitative (focus groups, interviews, etc.) and quantitative (survey, etc.) methods. It’s incredibly rare for organizations to invest the time in a thorough qualitative and quantitative assessment. Why? Some want quick answers; others think they have the answers already; and still others think they are actually measuring culture when they are actually measuring engagement and or other aspects of the work climate (involvement, teamwork, satisfaction, mission clarity, etc.). This situation will undoubtedly change as leaders begin to understand the subject of culture. It’s extremely important to start with the qualitative and to obtain some guidance as part of the process if you are new to the work. There are countless approaches, but I am a big fan of managing this work within the context of a problem. I like it when it’s not just any problem, but one of the most critical problems the organization is facing (customer experience, growth, innovation, etc.). It’s amazing how quickly basic gaps between “what we say” is important and “what we do” can be identified, but the key is to understand why. This dialogue can be taken to an entirely new level when insights about values and behavioral norms are introduced from a valid and reliable culture assessment. There are many blind spots that can exist in qualitative work with groups and it’s difficult to scale qualitative work across large teams. Remember, culture is like the air we breathe or water we swim in, so we often overlook critical aspects of our own culture. The sequence of qualitative, quantitative, and then qualitative again can bring a great deal of clarity, and measurement of some critical cultural norms is a key part of the process. This unified approach can transform the abstract into something leaders can understand through data, stories, and specific behavioral examples of how culture is impacting results and why. Leaders and change agents hear so many contradictory things about culture change that they are confused and may not know where to find the truth. I have interacted with hundreds of culture-related experts and consultants. While I won’t cover the specific “how to” content in this post, I will group the solutions in three major categories so it’s easier to identify the strengths and weaknesses of each approach. Culture alignment solutions: I believe this is the most prevalent category of solutions by a wide margin. It’s the one running rampant with survey vendors and many consultants. Some use surveys to supposedly define your culture and focus on clarity, values alignment, engagement activities, and other approaches. Success often depends on clear definition of the problem or outcomes targeted, engagement of the leadership and the broader organization in the process, and managing the work with a clear understanding of the underlying culture (the “real” culture in terms of norms, values, beliefs, assumptions, etc.). The key advantage is that engaging the workforce in helping to identify and change basic systems, structures, and leadership approaches can resolve countless issues (many of which are not culture problems but basic leadership problems). Clarity and alignment are desperately needed in most organizations, but they are a vastly oversimplified solution to deal with deeply entrenched cultural attributes. Couple this work with qualitative and quantitative culture assessment to understand the underlying assumptions driving the known issues and learn if they shift or evolve as groups use new approaches to solve meaningful problems. Mindset shifting and leadership development solutions: These solutions typically focus on understanding aspects of the “real” culture I referenced before (norms, values, beliefs, assumptions, etc.). This understanding may come from qualitative methods, quantitative methods, or both. Workshops, coaching, and other approaches are used to understand how basic beliefs are holding the organization back in some form and must evolve. Mindset shifting and leadership development solutions can be very effective and should clearly incorporate aspects of the other two solution groups categories to solve problems and drive learning. The current culture is reinforced in many ways leadership may not realize, so the connection to solving real business/organizational problems is key. I have interacted with numerous organizations that have used these solutions and sustainability seems to depend on the ability to connect the work to using new approaches to solve some of the most significant business/organizational problems. Some organizations are able to make that connection while others continue to struggle. The focus on solving problems or improving outcomes naturally involves aspects of the other two solution categories. I believe all three categories are essential in some form with sustainable culture change efforts. I prefer starting with the focus on a problem or outcome to drive short-term learning and results which encourage continued or expanded work. The qualitative and quantitative methods help with gaining a much deeper understanding of how BOTH culture and climate are impacting work related to the specific problem or outcome. Solutions typically involve “alignment” of some basic systems, but they are prioritized based on engaging team members in solving the problem. Quantitative survey data is evaluated as part of that process to help provide a language and expose blindspots. There are many other types of solutions linked to culture these days, but most have roots in one or all of these three categories. The depth ranges from the incredibly superficial to unique approaches rooted in neuroscience and neuro-organizational culture. It’s important to learn from a wide range of experts. My favorite culture book is the new edition of Edgar Schein’s Organizational Culture and Leadership. I am a bit biased regarding my favorite culture conference. I am a firm believer that intentional culture and performance improvement efforts should involve alignment of efforts across organization, team, and individual development. I am shocked by how often talent management plans are not integrated with culture and performance improvement efforts. The absolute best form of employee development comes from engaging groups in some of the culture development solutions referenced above because they are designed to support shared learning and results. These efforts can completely bog down if there is no intentional development of employees, starting with top leaders. Just one top leader can be a complete wrench in the team dynamic and undermine critically important change efforts. Employee development may be needed at many levels because you can’t focus on behavior change without understanding capabilities. I often see top leaders that honestly don’t know effective approaches to involving groups in decision making even though a culture without involvement is running on empty. The flip side of this issue is often team leaders and other key individuals who can’t seem to make the most of genuine efforts to involve or empower them in new ways. What culture shift is needed to support your strategic plan, and why? Before this clear decision and plan, you will drift, and you’re potentially ignoring the most powerful barrier to strategic change. It’s like Mike Tyson said: “Everyone has a strategy until they get punched in the face.” Leadership teams spend incredible effort defining perfect strategic plans only to have them undermined by predictable culture issues. The first step is not to suddenly change your strategy based on perceptions about culture. A practical first step is to engage in a culture and performance improvement effort that’s focused on one of your organization’s most critical strategic priorities or problems. Leadership and the broader organization learns from this initial work and applies what works to other key strategies or problems. I’ve seen this strategic approach successfully applied to build momentum and deliver initial results for 20 years across many different organizations. In each case, leadership was equipped to adjust their strategy to have a much better impact based on what they learned about their culture and managing effective change as a team. The culture chasm between our PRESENT situation of broad awareness to what’s necessary in the FUTURE to clearly connect culture change and performance improvement is vast. It’s no surprise that closing these gaps can be extremely powerful. One top leader told me that work related to closing these gaps within the context of his #1 performance priority helped provide “surgical clarity about our problems and how to approach improvement.” He also said it would “turbocharge their performance improvement plans.” This feedback is very common as teams become more comfortable discussing the undiscussable and overcoming related obstacles as a team to improve performance. The image I want to leave you with is an open door. There’s an open door to move out of the present situation in most organizations and to understand culture as a foundation for accelerating performance. If you are a leader or change agent, it’s imperative to continue your culture learning journey and translate the knowledge to action. Culture change happens at the intersection of curiosity and courage. It can help tremendously to obtain some coaching from an expert. If you have a heart problem, you go to a heart doctor. If you have a culture problem, go to a culture expert and understand their background and approach to help you close the present-future gaps above. It’s possible to make substantial progress in only six months. Unfortunately, many go to engagement experts, lawyers (in a crisis), communications experts, or others and never truly understand the underlying culture and the impact on performance. They think they tried the culture thing and it didn’t work, but they lacked the know how to manage this extraordinary journey with a reasonable amount of clarity and confidence. After over 150 weekly posts on CultureUniversity.com, this awareness-education gap only appears to be widening. I believe it will take experts and industry organizations (associations, foundations, etc.) working together to close this gap in meaningful ways that impact large numbers of organizations. We can’t afford to wait for each individual organization to have their cultural enlightening completely on their own. It will take forever, and the unacceptable negative impact on individuals, organizations, and society will continue. The present-future areas in the image above also apply to industry organizations that need to understand how culture is impacting the most critical priorities of their members or other organizations they support. Hopefully, we’ll see more industry organizations doing the right thing and helping to shape the future of their industry through culturally intelligent means (culture research, education, sustainable best practice sharing, etc.). It may be the only way we’ll reach the critical mass necessary to close the culture awareness-education gap and rebrand culture as the sustainable performance driver it is. Please reach out to me if you have some ideas about making an impact together. Note: It is not necessary to request approval to share this article for an educational purpose as long it is shared in its entirety with proper attribution.